Fair Pre-Owned Condition: Previously worn Shoes with minor visible flaw(s) and/or significant wash wear/fade can be considered in Fair condition. COLOR Brown. How we calculate our Pre Owned shoe size, we use the size chart printed on the shoe if available, if Not we calculate the size using our international size shoe chart mm. De Blossom Collection. 3.5" Wedge Heels. Flaws - Wear on bottom back heels. Widest Across Ball Of Foot 3". Inside Front To Back 9". Outside Front To Back 9.5". 1" Platform. 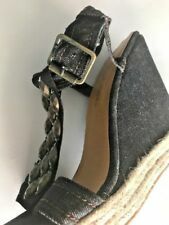 These De Blossom Black Strap Wedges are in very good condition and gently worn. De Blossom .